Learn how to catch Florida's most colorful freshwater gamefish, the Peacock Bass. Known for it's explosive strikes and incredible fighting ability, these relatively new residents of south Florida offer anglers year-round fun. Colorful, Aggressive, and FUN, join Capt. Frank Carbone to learn how to catch Florida's most colorful freshwater gamefish, the Peacock Bass. Known for it's explosive strikes and incredible fighting ability, these relatively new residents of south Florida offer anglers year-round fun. Capt. 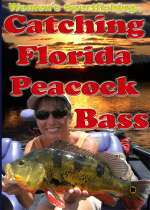 Carbone, a full-time guide, teaches how and where to target peacocks. He discusses gear, equipment, lures, and seasonal differences. His years of experience really show through as another successful trip is logged. So, sit back and relax and learn to catch the explosive and colorful Peacock Bass of Florida.